Of course, I might be way out in the blue here - I'm not saying that anything of what I have written here is the truth! I once found a site on the internet that was talking about Tolkien's world as a historical fact. I was thinking hmmmm ... this is new for me. But after a while I thought that I have to give this thought a try. I told my discovery to a friend I have on a forum on the internet, and she told me that the Red book of Westmarch was once found in a grave and was given to Tolkien for translation, and the book has been in the posession of the Tokien family since then. Ok what happened two hours after I had this thought? I heard the news about the earthquake in Iran that had taken over 30,000 lives. Huh ... Should I go on? I questioned myself. I continued to study the maps and discovered that what I thought cannot be. The distances are enormous, so I scale it down a little. Not until I placed the Misty mountains over the Scandinavian mountains did things start to match. The mountain ridge with Mount Gram at its point is today called Lofoten in Norway. The Grey mountains stretch towards Murmansk and the white sea. And Isengard in South Norway. The River Anduin is submerged in the Gulf of Bothnia and the Baltic Sea but the springs and the river Langflood is still there as the river Torne (torneälv) on the border between Sweden and Finland. Mirrormere is still there but with the name Lake Kall and the river Silverlode is named the Indal (Indalsälven). The point where the rivers Nimrodel and Silverlode meet is today a lake named Great Lake (Storsjön). Mirkwood might have been in	Finland and Dol Guldur would have been close to the city of Vaasa. Fangorn is placed where today is Finnforests (Finnskogarna) in Sweden. There are many tales from those forests. Those who live there say that the forest feels alive around them. And that would explain the pottery shards and the silver jewellery that was found on Sørøya, which would have been in the north of Anor. So far so good but new troubles came up. I can't spot the White Mountains anymore, or the mountains around Mordor (I can't believe that those mountains have just disapeared). 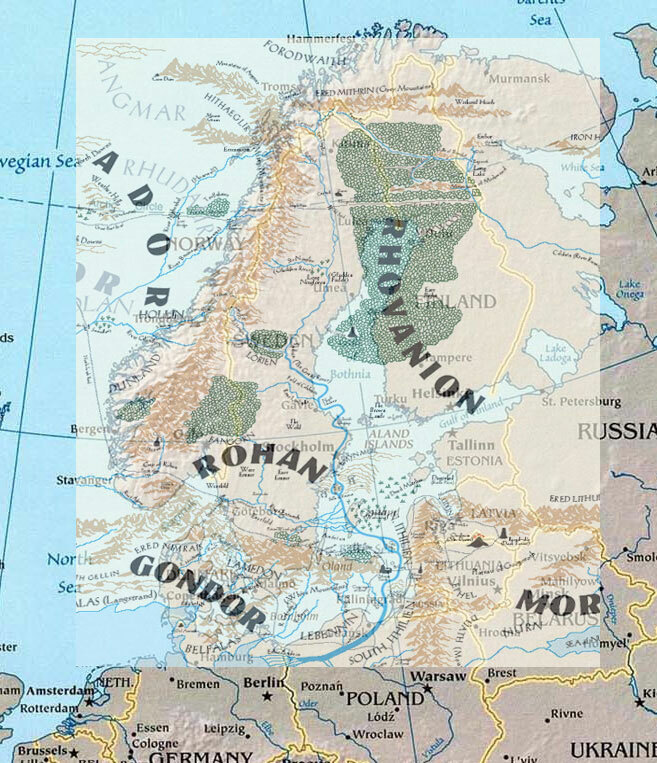 Well, I think that the maps of Middle-earth are not exact, so I guess that lands and mountains can be out of place. And with some help from eroding powers and tectonic shifting many things can have happened since the Fourth Age. For what I have seen there is no documentation for the Fifth Age. I can try to fill that age in a little. A natural disaster happened so the poles of the earth changed position and the earth was thrown into an ice age. Most of the land was pushed downwards under the heavy pressure of ice. And the ice eroded the mountains and lands. Actualy I think that land was moved (how I explain that I don't know). When the ice melted away (and the earth got a brand new start) the Misty Mountains were now closer to the north pole and got a colder climate. 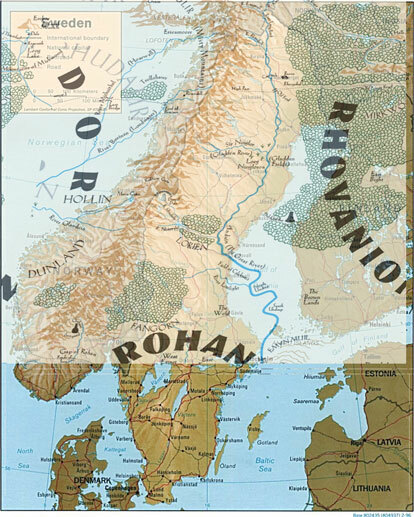 The White Mountains were pushed to the south east so the Gap of Rohan is now wider and contains Denmark, Germany and Poland and became the Carpathian mountains. Mordor was pushed even further away and became what today is called Iran. The United Kingdom and Ireland can be a part of the Blue Mountains and the western part of the Shire might be left on the east side. And the Scottish highland is Emy Uial [sic] in Eriador. But the rest, lets say from the Brandywine and towards the Misty Mountains is submerged under the North Sea. The Grey Havens might be in the sea between Ireland and England, or in the Bristol Channel. But both the White and the Black Mountains might have been destroyed during that period so nothing is left. Then the White Mountains would have been in Denmark through southern Sweden and out in the Baltic Sea and the Black Mountains would have been in Latvia and Lithuania. alt-tolkien.com/timeline.html (entry for 1992-1995, Sixth Age).